Analyzing Mairwöger's paintings one sometimes has the feeling he paints less according to a preconceived concept of composition and colors, but rather that shapes are developed and colors chosen as the painting is being executed, that decisions are determined by the interaction of forms and colors as they come into existence- as they "happen" on the canvas. Such an intuitive method of painting requires an experienced feeling for colors, a mastery of technique and a certain fluency in the execution. Mairwöger's work is always the expression of his inner self, paintings that invite the spectator to look closely and reduce his attention to his emotions. His paintings are valuable friends in modern times that seem to continuosly accelerate every day, as they provide their owners with moments of peace and concentration on their own inner self and emotions. In the first years, the influence of Mikl and Hollegha, two well-known Austrian abstract painters and Mairwöger's professors at the Vienna Art Academy, is evident. There is a certain painterliness combined with graphic elements evoking an, at least partial, illusion of three- dimensional imagery and space, as well as a modulation of colors and a use of value contrasts which create sculptural effects. During the early years at the academy the pictures are basically representational. Flowers are a frequent motif for a long period. After Hollegha takes over the class and invites him to stay for some time in Rechberg (Styria), Mairwöger becomes interested in the compositional possibilities of trees and branches. The fascination lasts up until the paintings done in Lucca (Italy) in 1976, where Mairwöger lives for two months. Even if trees and countrysides are not directly recognizable, there is the feeling of space, light and mood of the wooded areas of this region. Transparent tints and pastel vapors are allusive of early morning mists and mysterious landscapes of Tuscany. Considering both his output and his limited financial means, painting on canvas is too expensive for Mairwöger and so most of the time he works - with oil colors- on less costly white carton or strong paper which he does not prime. When he does paint on canvas he uses an extremely dry priming as foundation with a surface quality somewhat like that of plaster of Paris. Choice of paints and method of application is adopted from Mikl and Hollegha. 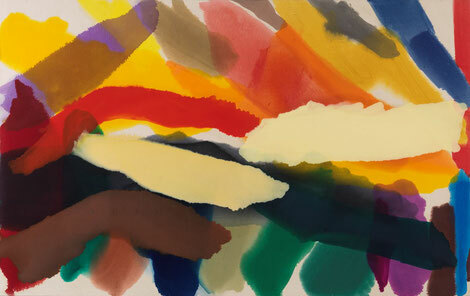 The main element of this technique is to thin down the paint medium with turpentine until it acquires a consistency similar to that of water color- a device also used by the American painters Helen Frankenthaler and Morris Louis. After meeting Clement Greenberg in Hamburg in 1976 Mairwöger decides to use the technique of painting with a thinned down paint- medium directly on raw canvas. This confronts him with a problem which already his teacher and the painters Frankenthaler and Louis faced, that of the "halo" effects caused by turpentine which appears around the fields of color. Both in his earlier work in which the subject matter is recognizable, and later in his "abstract" paintings, there is a considerable gestural quality. The element of movement however differs from the gestural features in Mikl's or Hollegha's work, which comes from the Action Painting of the fifties. The sweeping gestures of Hollegha and Mikl are based in the automatistic ideas of those years- as developed by Pollock and Frankenthaler- although possibly the psychoanalytic aspects and the determined probing of the unconscious are less emphasized in the work of the Austrian painters. In Mairwöger's paintings the aspect of motion has less relevance. If there is movement, especially in his late paintings, it is less dynamic, less explosive. Sometimes shapes seem to float. On the whole the images seem the result of controlled body or hand movements, and not of ecstatic automatism. Often the forms and shapes are altogether static. Moving towards simpler and less complicated shapes later, the colors become more intensive and their brilliance accentuated. In the paintings done before 1976 the fields of color often fade one into another- Since the painting "Trees in Murau" done in the fall of 1976, the forms become clearer and more decisive and the colors of the shapes tend less to fade out as much at the edges. The chromatic quality is bolder and the area of color more uniform. Mairwöger is aware of the dangers of virtuosity. Thus he constantly forces himself to seek new pictorial ideas, new compositions, new color combinations and even new proportions and sizes of canvas. Knowing of the dangers of mannerism he seeks to avoid solutions which he by experience knows "work". He is conscious of the necessity to constantly take risks and challenge himself. Basically the artist is concerned with the relationship of colors. In his earlier work Mairwöger is mainly interested in the subtle modulation of colors and the overlapping of configurations, which is achieved by laying down layer upon layer of thin transparent pigment; starting in 1985, colour is applied mostly with scrapers in a relief-like way, thus creating a certain spacial quality. 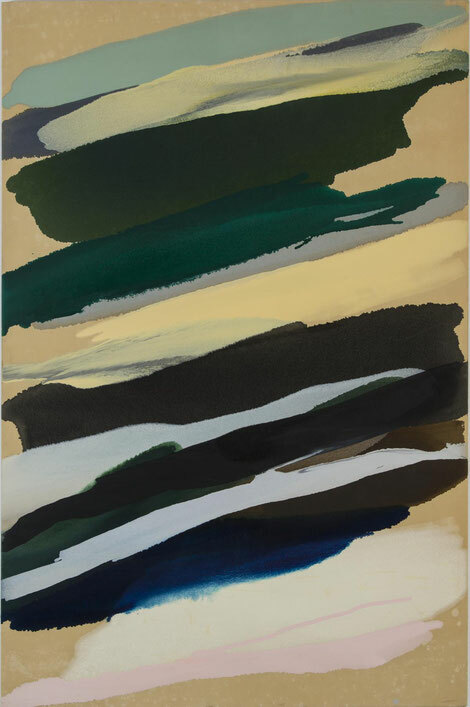 Mairwöger experiments and adopts a wide range of the palette, unafraid to place brilliant reds aside of intense greens and to contrast warm ochers and oranges with cool blues and purples. Sculptural, three-dimensional effects, applied on large formats of canvas are the main expression. Later the three- dimensional elements disappear more and more. The paintings become flatter. The emphasis is more on color and on shape. The attention is focused on what happens when color meets color. In some of the most recent paintings a certain playfulness can be found in his paintings. This is brought about not by introducing allusive imagery, but rather achieved through a gaiety of colors and a tilting of shapes against each other in a somewhat voluminous fashion.